• Digital Piano Controller app for iOS touch screens helps you access features quickly and easily, such as metronome, voices, reverb, and more. i don't have a lot of experience with digital pianos as i only have one other piano, but this piano is awesome! my only complaint is that it's a bit difficult to remember what buttons do what, how to delete a recording, etc. but other than that, amazing! This may be alright for a child who is learning piano. In my case an establishment I play professionally for got rid of their clavinova which was satisfactory and got one of these. It is UNPLAYABLE as a live stage instrument. THERE ARE NO CONTROLS for quick changes in instrument selection, reverb/chorus parameters OR ANY OTHER parameter ...you must press a button and then PRESS ONE OF THE INSTRUMENTS KEYS ...all of this is UNLABELLED!! .....how is one expected to press one of the piano's keys to change a setting mid-performance. It cannot be done. Imagine being asked to use a computer and select an application and adjust its parameters when no screen is present. Same thing here ... Yamaha digital pianos are ok. Strictly speaking their plain pro digital piano keyboards are better than the ones passed off as pianos. THIS HOWEVER, IS AN ABOMINATION AS WELL AS AN INSULT TO ANY PROFESSIONAL PIANIST. For the money you can do much better. I upgraded from an entry-level keyboard to this one and immediately noticed an amazing difference in the sound and feel. I love the real pedals instead of plastic single pedal too. 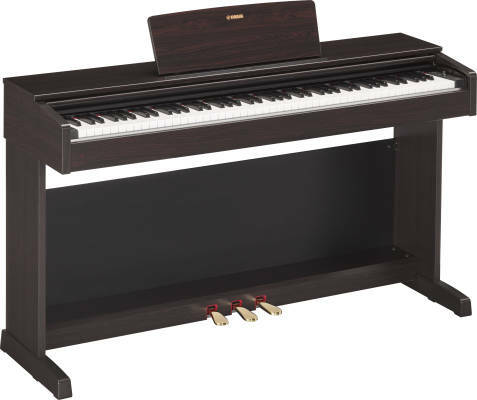 I don't currently have space for an acoustic piano, this compact model looks classy and fits anywhere. I just wish the buttons/features were a little more user-friendly; it's not easy to change between voices/piano sounds and I wish the metronome displayed the tempo/bpm. Overall though the sound and feel is outstanding for the price, I used to play classical piano years ago and this will be what I will practice on as I try to get back in touch with the craft. I love the whole package with stand and bench, very happy with my purchase. I've owned this piano for several years now, and it has remained a personal favourite. The touch and quality are superior, as well as the overall look of the piano itself. This piano is beautifully crafted. The only complaint I have is not being able to see the tempo of the metronome, but other than that, this piano is superb. I highly recommend it, especially to beginners. It is worth a considerably low price for a piano as good as this yet delivers all the expectations of a piano that costs three times as much. Overall, it's an essential instrument that indeed is magnificent and will pretty much rock! Great piano, good value, plays good.